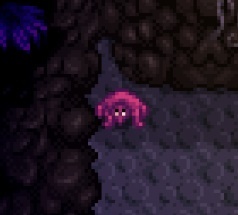 Rock Crabs are an enemy found in The Mines. They disguise themselves as stones, sometimes surprising the player. When immobile, they are invulnerable to attack, though they can be hit with a pickaxe to knock them back, making them mobile again. To identify the Rock Crab, look out for rocks without shadows, sometimes slightly overlapping nearby rocks, as well as rocks on dirt patches (not including Nodes). The Rock Crab can only be dealt damage if it is mobile, and not hiding beneath its shell. Strike an immobile Rock Crab with a pickaxe to make it mobile again. Striking a Rock Crab with a pickaxe enough times will knock the shell off of its back, and will cause it to flee. Alternatively, setting off a bomb near a Rock Crab can remove its shell, and will cause it to flee as well. Only occurs if the rock crab is standing in the middle of a 2x2 area next to a wall – if you hit it with a pickaxe when its shell has already been broken, you will instead hit and break an imaginary rock that isn't there instead of hitting the monster. This page was last modified on 21 April 2019, at 21:41.